The BOSS and HUGO brands are sold via the Group’s own retail business and wholesale business, both online and brick-and-mortar retail. Its own retail constitutes the most important distribution channel, and has been further expanded in recent years to focus even more on customer needs. In fiscal year 2018, as in the prior year, it made up 63% of Group sales. At the end of the year, the Group was operating 442 freestanding retail stores around the world (2017: 439). 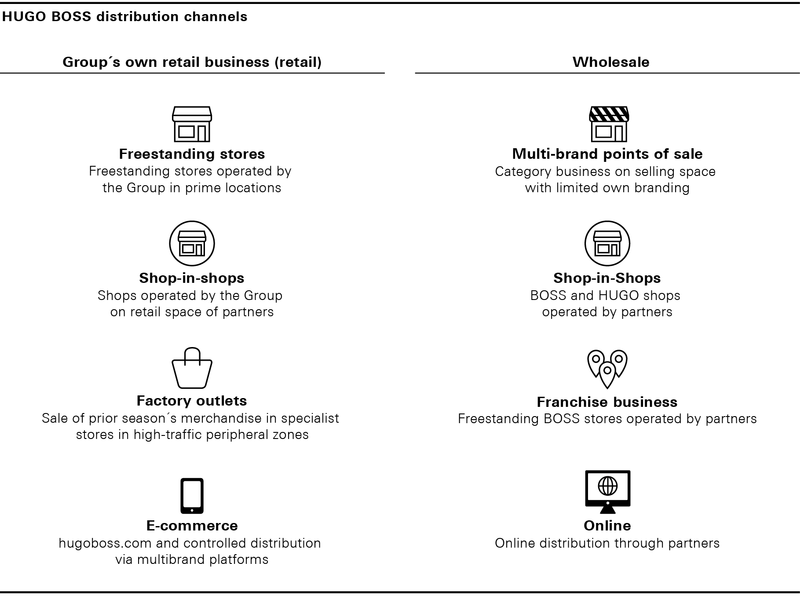 In addition, HUGO BOSS operates outlets as well as a concession model in cooperation with selected wholesalers in the form of self-managed shop-in-shops in department stores. By expanding its omnichannel services, the Group is increasingly connecting its brick-and-mortar retail business with its e-commerce business. By visiting the hugoboss.com website, customers are able to explore the BOSS and HUGO brand worlds and place orders in nine European countries as well as in the United States and China. In addition, the concession model is also intended to be deployed increasingly in the online area in future via cooperations with so-called multibrand platforms. 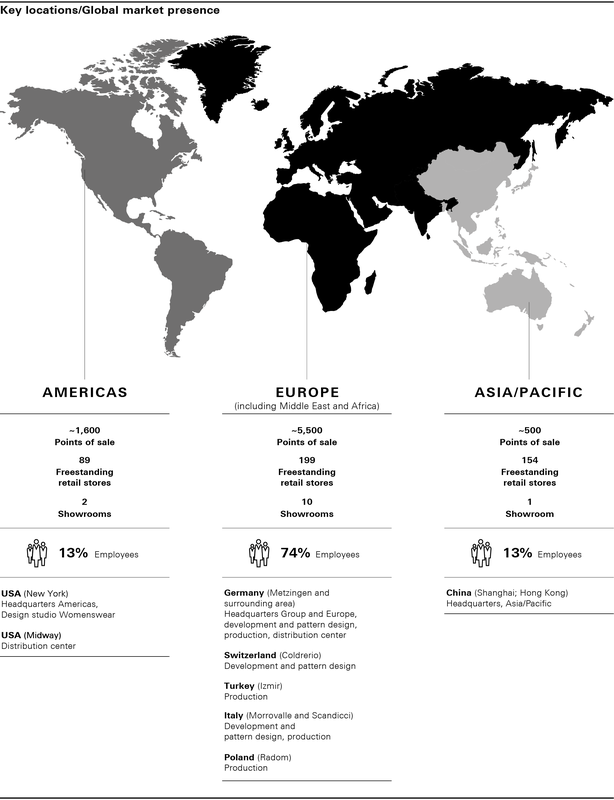 The HUGO BOSS Group is structured by region. The Group’s business segments are Europe (including the Middle East and Africa), the Americas and Asia/Pacific as well as the licensing business. The functions established in the central departments of HUGO BOSS AG cover significant parts of the value chain, particularly the development, production, sourcing, and market distribution of the collections. The centrally developed Group strategy has been designed and implemented to suit specific markets to ensure strict customer orientation and enable a fast response to market-specific trends. The individual markets are placed in hubs that are managed by a responsible director who reports directly to the Chief Sales Officer of HUGO BOSS AG. This ensures close alignment with the central functions and short decision-making processes. In addition, certain functions are pooled in the hubs across countries to make effective use of specialist skills and to generate cost benefits.